On Monday, May 1, three local organizations filed a motion against the closure of the Beachwood Drive gate, which leads to the Hollywood Sign. GRIFFITH PARK—On Monday, May 1, homeowners and Griffith Park preservationists from three local organizations filed a motion in Los Angeles Superior Court to challenge Los Angeles’ April 18 decision to close the Beachwood Drive gate, which provides access to the popular Hollyridge trail to the Hollywood sign. The suit was filed by the Griffith J. Griffith Charitable Trust, which represents the estate of the magnate who donated the land that became Griffith Park; Friends of Griffith Park, a non-profit group that promotes the stewardship of the park; and the Los Feliz Oaks Homeowners Association, which represents a neighborhood affected by the closure. The groups contended that permanently closing the Beachwood Drive gate blocks entry to public land and illegally gives a private party control over government property. According to the Los Feliz Oaks Homeowners Assn. website, they consider the city’s decision to be unjustified and in direct contradiction to the ruling. The Beachwood Drive gate closure stemmed from a legal battle with the owners of Sunset Ranch Hollywood Stables, a horseback-riding facility in Griffith Park, who have long had an agreement with the city to allow pedestrians to walk through a 20-foot wide strip of land near the gate. In their suit, they claimed that the city had directed hikers and tourists to use their “exclusive easement road” by telling them they could reach the area through a new gate, impeding access to Sunset Ranch. In February, Los Angeles Superior Court Judge Elizabeth R. Feffer determined the public could not be prohibited from using the road and that the ranch does not have exclusive right to the land. But she also found that city officials had channeled thousands of pedestrians through the easement, interfering with the ranch’s use of the land and customers’ access to the stables. The Los Angeles Department of Recreation and Parks was forced to close the Beachwood Drive gateway. Following Judge Feffer’s ruling and the gate’s closure, hikers and tourists were directed to other paths leading to the Hollywood sign, including the entrances at Canyon Drive and Vermont Canyon. According to the Oaks Homeowners Assn. website, the Hollywood Sign is “demonstrably not located” at these locations. The ruling prompted mixed reactions from local residents. Those who complained of traffic and safety issues near the ranch supported the decision. Others argued that the path should be easily accessible to pedestrians and redirecting the entrance might result in further problems. 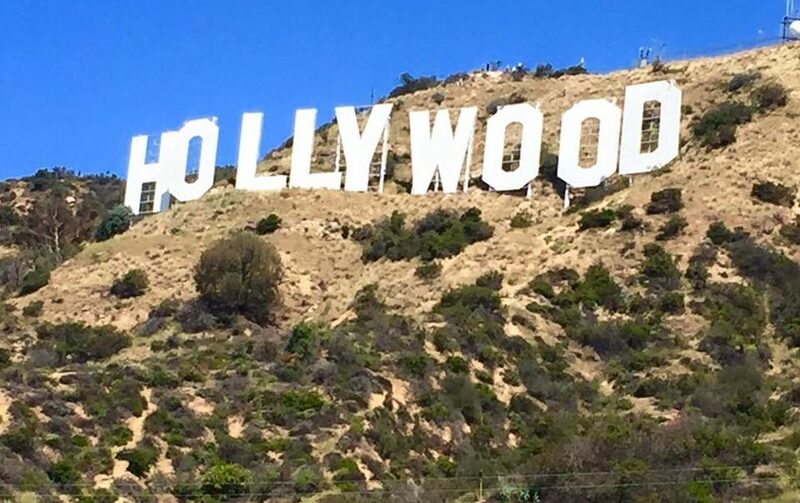 Some residents maintained that the city should have considered other ways of fulfilling the court order before completely blocking access to the Hollywood sign through Beachwood Drive. On April 15, Friends of Griffith Park held a rally, demanding Beachwood Gate be kept open to the public. “The rally is to raise public awareness of the proposed closure and to express the need to keep access to Griffith Park, a public park and Los Angeles’ largest historic-cultural monument, open to the public,” Friends of Griffith Park said in a statement. The groups challenging the closure expressed concern that directing pedestrians to other access points may cause an increase in traffic elsewhere. Traffic along Canyon Drive, into Bronson Park, and up Vermont to the Observatory already increased prior to the closure, according to the Oaks Homeowners Assn. They also alleged the city had falsely claimed that the Canyon Drive entrance is 1,500 feet east of Beachwood Drive, when the actual distance is closer to 3 miles. Friends of Griffith Park members have suggested that the city might have opened a trailhead closer to the Beachwood Drive gateway, allowing people to enter without interfering with Sunset Ranch traffic. Attorney Mike Gatto, who represents the three groups, told Los Angeles Daily News that the motion will allow the groups to have a voice in the final settlement and to speak on behalf of local residents. Estevan Montemayor, a spokesman for Councilmember David Ryu, said in a statement that “the city of Los Angeles lost in court” and did not elaborate further on the options the city might have considered.